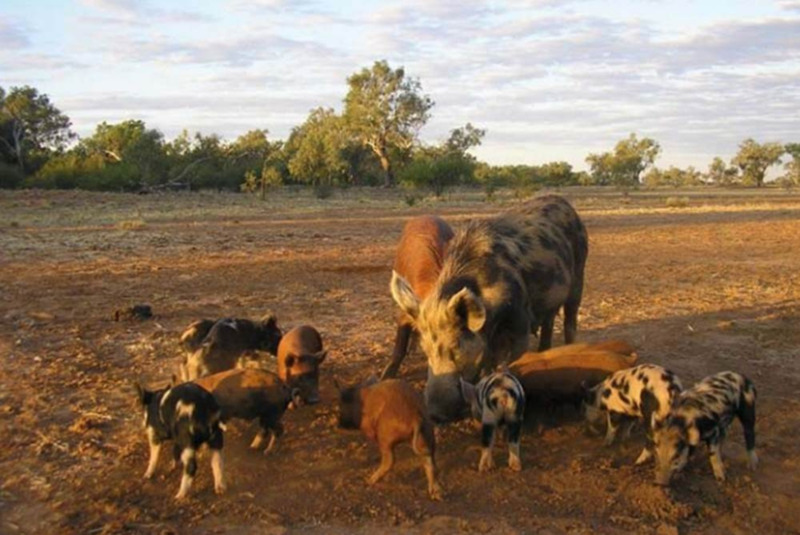 Feral pigs are declared pests in Western Australia. This article provides information on controlling feral pigs by trapping. Trapping can be an important means of reducing feral pig numbers. However, the technique is time consuming and traps are expensive to construct and maintain. This means trapping is best used either where poisoning is impractical, or as a follow-up control measure after poisoning. The effectiveness of trapping is influenced by site selection, free-feeding, trap type and construction method, and on the behaviour of the pigs. Best results are achieved when the pigs are short of food and the trap sites have been carefully selected. Once the decision to trap has been made, keep interference to a minimum. In particular avoid shooting and do not allow disturbance by dogs. Traps should be sited where pig activity is already concentrated. Examples include beside pads or resting areas, near feeding areas in crops or pasture, or close to watercourses or wallows. Free-feeding is essential to attract pigs to the traps and should begin before the traps are constructed. A variety of foods may be offered including grain, feed pellets and fruit. Water has also proved to be attractive to feral pigs in dry conditions. Do not start building the traps until food is regularly being taken by feral pigs. Ensure that food is being consumed by feral pigs and not by other species such as kangaroos or domestic stock. At this time restrict free-feeding to the area close to the traps. If the pigs are wary, construct the traps in stages over a few days and fix them open to allow free entry and exit to the pigs. Ensure that plenty of feed is available both outside and inside the trap. Do not ‘arm’ the traps until pigs readily enter them to feed. Three basic trap designs are in common use. All are steel mesh live traps that the pigs enter through a one-way gate. Traps must be very robust and strongly anchored; steel mesh panels are welded or wired together and wired to star pickets driven (on an angle) securely into the ground. Bury the base of the mesh for extra security, making sure it does not keep the entrance open when the trap is armed. Roof the trap with steel mesh if the trap walls are less than 1.75m high. This is constructed of at least four rectangular weldmesh panels that may be supported on a steel frame. Panels should be a convenient size for transport and handling. Traps are erected to form an enclosure, supported by star pickets angle-driven into the ground outside the trap at the corners and centres of the panels. Bracing with cross wires between the pickets may strengthen the trap to withstand the impact of large boars. Entry to the trap is by a side-hinged or vertical gate. This is a transportable cage made of weldmesh on a steel frame. It is usually small enough to be carried in the tray of a utility. Entry can be via a side-hinged or vertical gate.